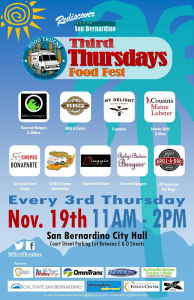 It’s the third Thursday of the month, which means food trucks will be serving in downtown San Bernardino today (November 19). 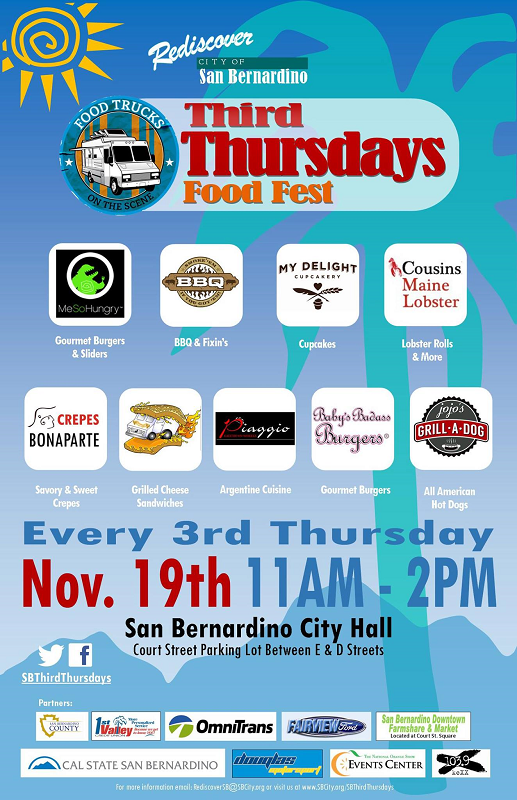 As usual, the trucks will park from 11 a.m. to 2 p.m. in the city hall parking lot on the south side of Court Street, between D and E streets. Nine food trucks are scheduled to serve this month, including Baby’s Badass Burgers, Cousins Maine Lobster, Crepes Bonaparte, The Grilled Cheese Truck, Jojo’s Grill-A-Dog, Me So Hungry, My Delight Cupcakery, Piaggio on Wheels and Smoke’em If You Got’em BBQ. Attendees who donate non-perishable food items at the X103.9 booth at the event will be entered to win a pair of tickets to Disneyland. The San Gorgonio High School Spartan marching band is scheduled to perform. For updates, “Like” the event on Facebook or follow ’em on Twitter.